When we first moved to Orlando 5 years ago it was all about the mouse. 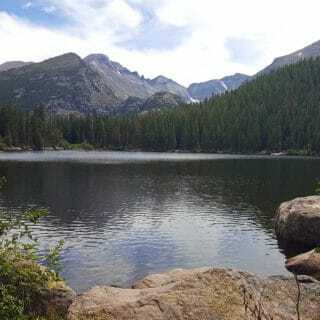 But it didn’t take me long to realize there was a lot more to the area and better lodging choices for my friends and family that came to visit. This is a sponsored post for the Omni Resort at Championsgate. All opinions are honest and entirely my own. 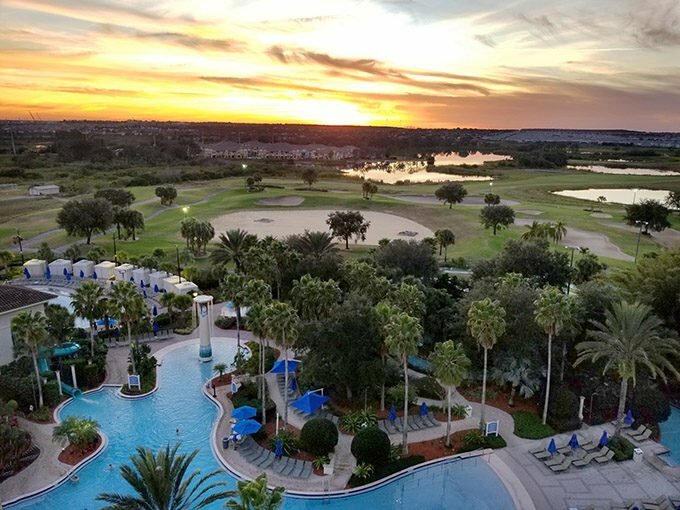 When it’s time to plan your next vacation to Orlando make sure to check out the Omni Resort Championsgate. With your favorite Theme Park just minutes away, you’ll be able to relax in comfort at the Omni away from the maddening crowds. You’ll be able to spend time with the family at their large winding pool, state of the art Wave Pool and relaxing Lazy River. And if you need some “me time” to catch up on your reading or just need a break, you can grab a lounge chair or cabana at the adult only pool. 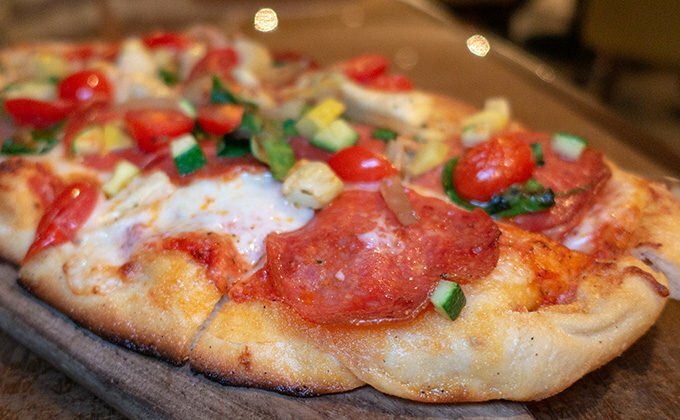 And you may want to indulge in a margarita or two. I can highly recommend them! And a day at the pool isn’t complete without one of Croc’s famous Double Cheeseburgers. 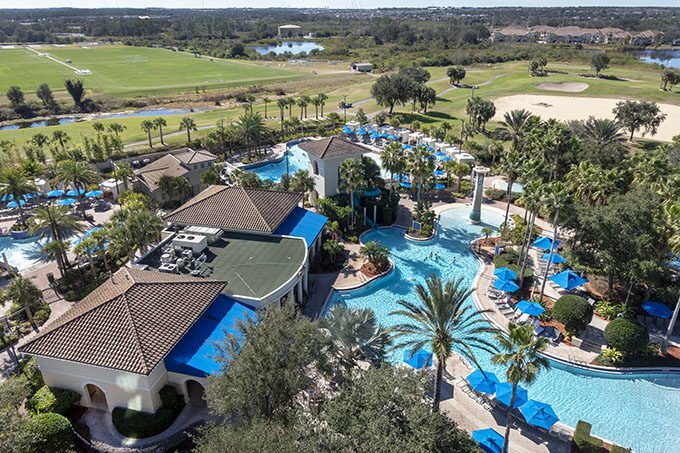 If there’s a golfer in your family, the resort features two championship 18-hole golf courses designed by Greg Norman, a lighted nine-hole par 3 golf course and even a miniature golf course for the family. 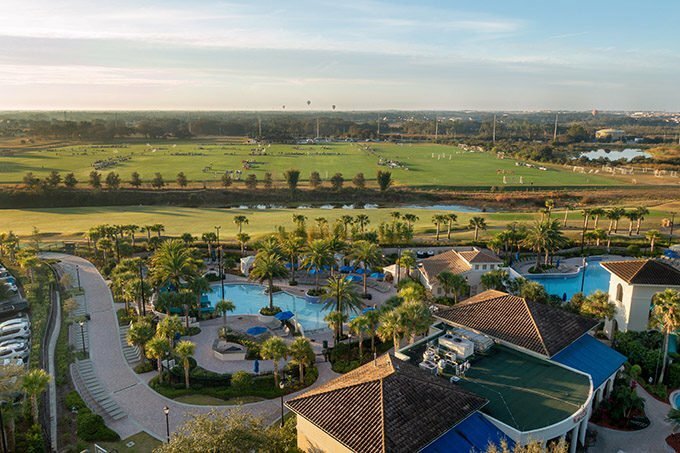 On this sunrise picture from my room at the Omni Resort Championsgate, you can see 8 soccer fields and part of the golf course. Although they’re very small in the picture we were treated to a group of hot air balloons lazily flying by the resort. But you know I come for the food….lol. Yup, I’m a Culinary Travel Specialist and I eat for a living. On our first night at the Omni, we were treated to a preview of the Valentines Day Menu at David’s Club. 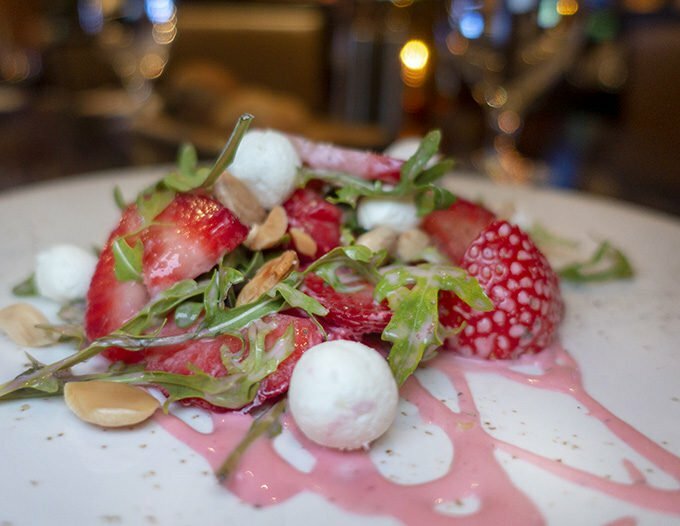 The first course was this delectable Strawberry and Goat Cheese Salad and a beautiful creation for Valentines Day! 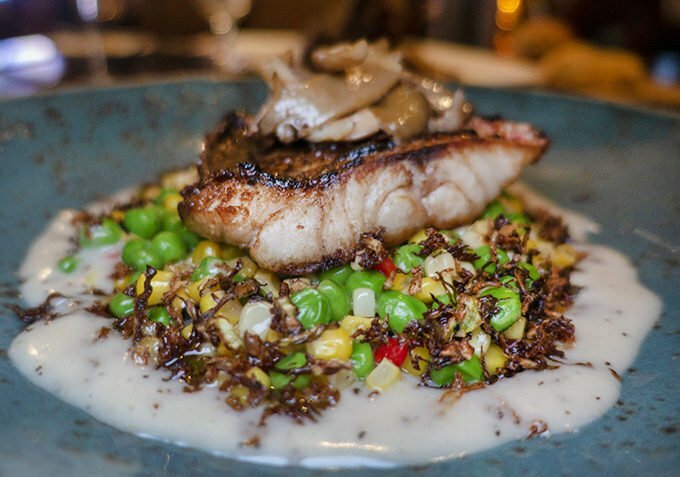 The chef offered two dinner specials and Lisa went with the Yellowtail Snapper with a Roasted Corn and English Pea Succotash with crispy Brussels Sprouts and a Roasted Lemon Vinaigrette. 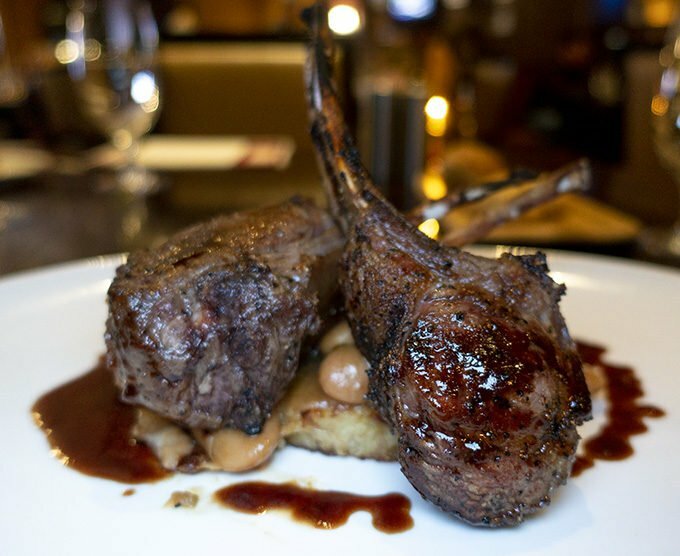 My choice was the Rack of Lamb with Potato and Proscuitto Hash, Merguez and White Bean Ragu and a Rosemary Demi-Glace. I will admit to gnawing the remainder of the meat off the bones while no one was looking. 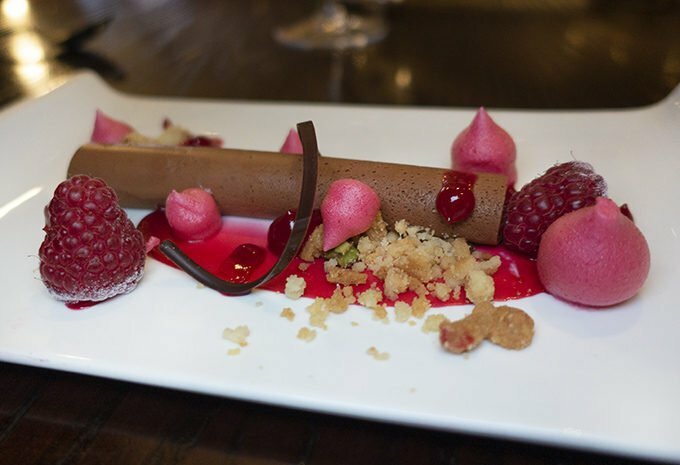 Dessert was a Valrhona Chocolate Mousse with a Strawberry Gelee, Strawberry Foam and Cinnamon Crumbles. It was heavenly! The Art of Breakfast at the Omni Resort Championsgate is a delicious event and not to be missed. 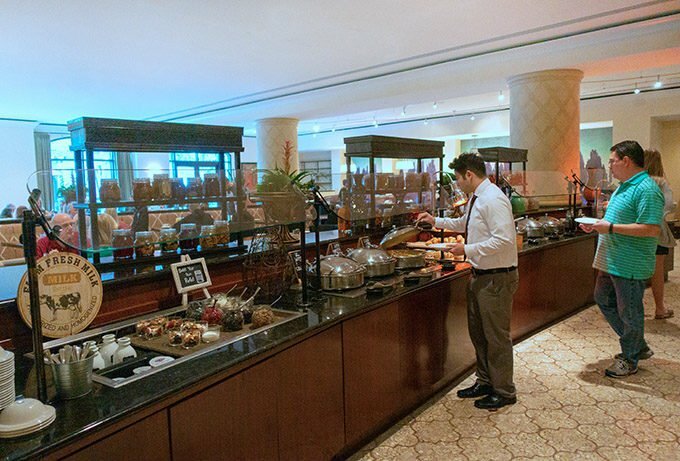 Served in Trevi’s a bountiful buffet is set up with the choice of tempting breakfast specials. 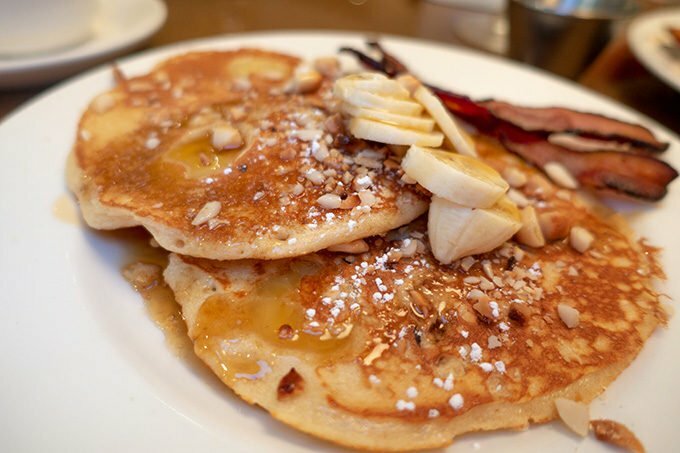 I absolutely love these Banana Macadamia Nut Pancakes. 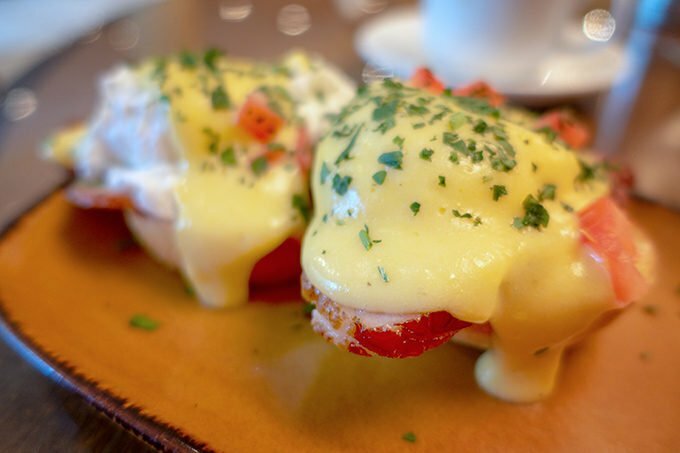 And I can’t resist Egg’s Benedict and these were some of the best I’ve ever had! If you haven’t guessed it I love Italian Food and I especially love pasta dishes. I couldn’t resist the Pasta di Frutti di Mare. 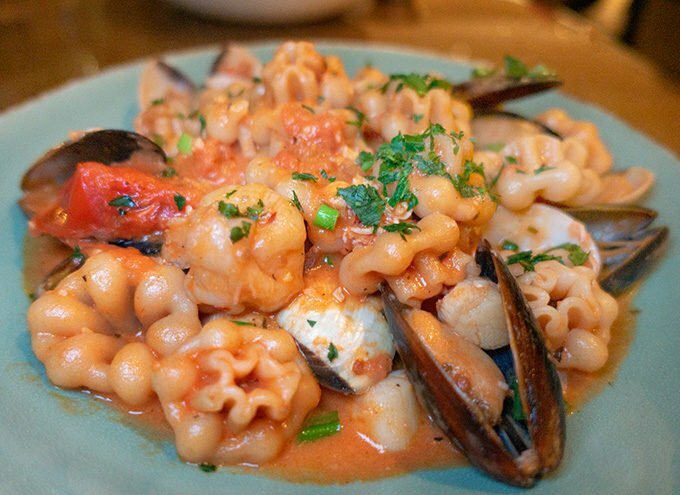 Fiore pasta (Flower shaped) with shrimp, mussels, clams and lobster meat in a light tomato sauce. It was ah-mazing!! 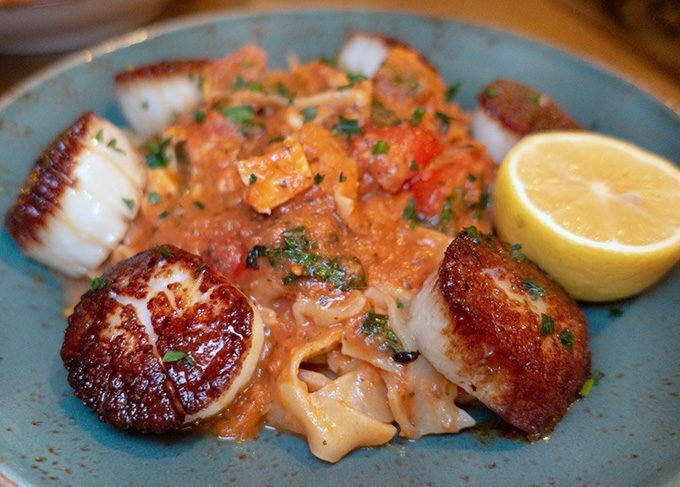 Lisa loves scallops and the Cappesante con Pappardelle were perfectly seared sea scallops and pappardelle pasta with a white truffle tomato sauce. She begrudgingly shared it with me and I the flavors were incredible. At this point in the evening, we decided to move outside for dessert. It had been a perfect day and enjoying dessert with the gentle cool breeze was a wonderful way to end our dinner at Trevi’s. 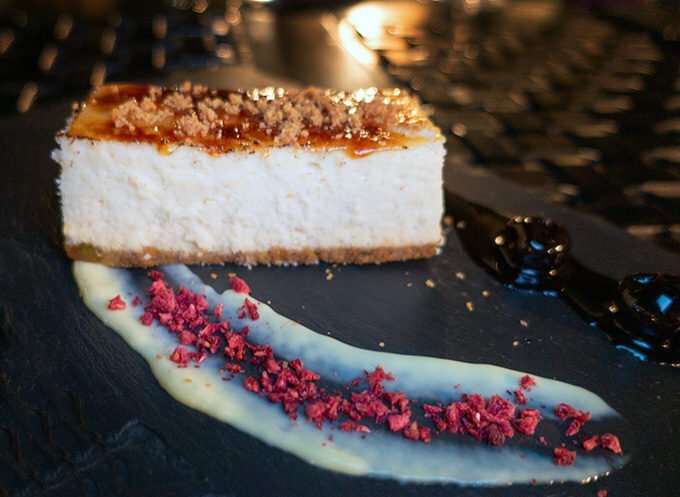 This Ricotta Cheesecake was a delicious end to a perfect meal. Sadly I didn’t get to try the Omni’s Asian themed restaurant Zen. I did look at the menu and will be returning with friends to try the Zen Experience. I just need to wear my stretchy pants and be ready to eat for a few hours. But hey I’m a professional…. I eat for a living! It was a bittersweet goodbye as we drove home(20 minutes) from the Omni Resort Championsgate as our incredibly delicious staycation came to an end. But the good news is, it’s not far from home. 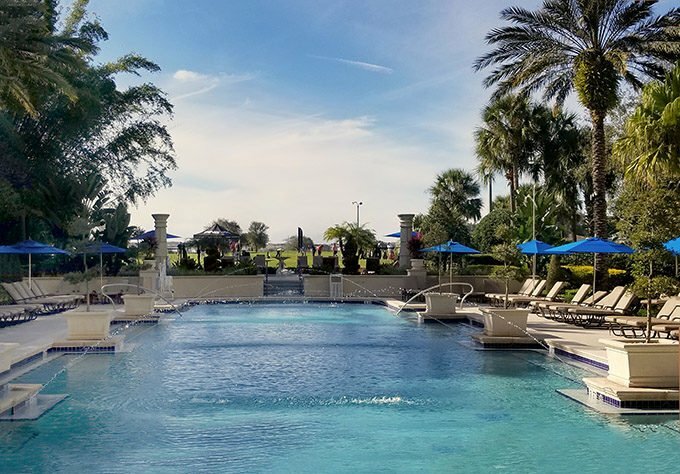 If you enjoyed my post about the Omni Resort Championsgate please leave a comment, I love hearing from you! 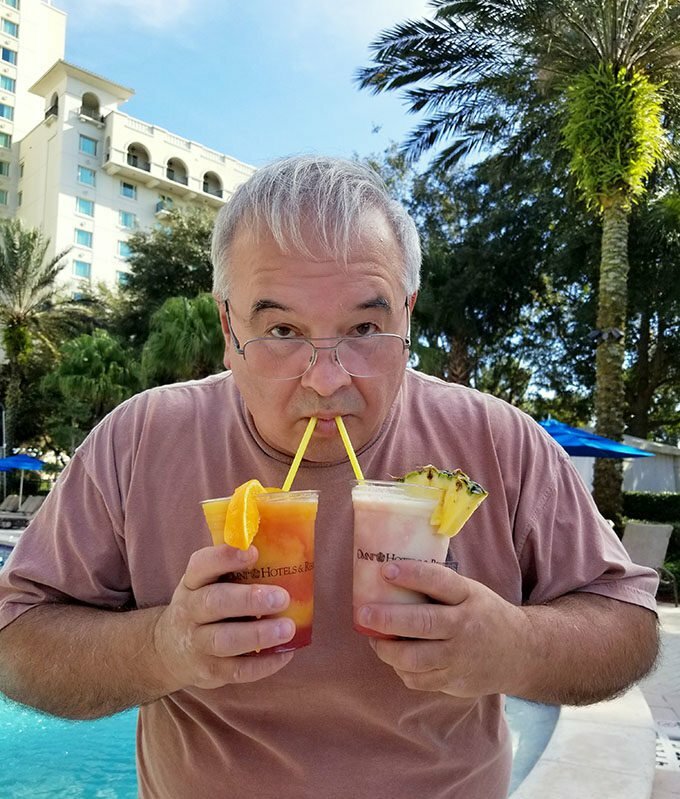 This is an affiliate link and If you are booking a trip to Orlando or anywhere else in the world I would appreciate it if you could use this link. The added income helps me keep traveling and writing about my travels. Oh man this hotel looks AMAZING!! I would love to stay there the next time I travel to Florida!! This sounds like such a beautiful destination. 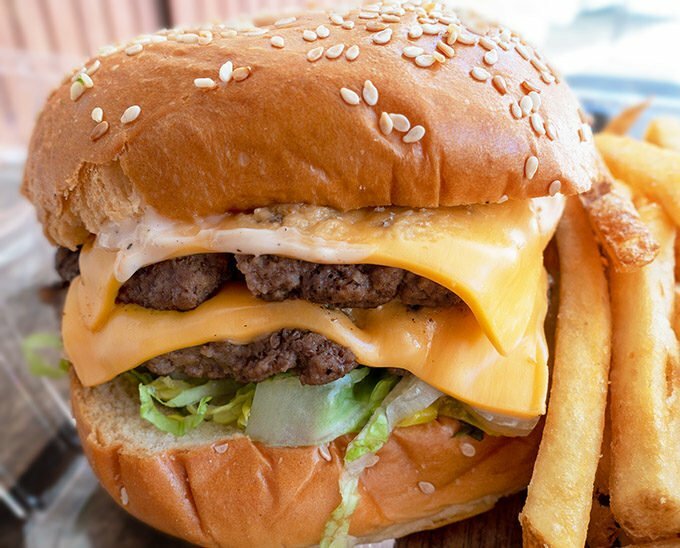 That double cheeseburger is totally calling my name. I would love to visit this resort one day. What a stunning place to relax and getaway! The food alone looks worth the trip and I would also appreciate the adults only pool. I imagine myself with a Margarita near that amazing pool! It’s my dream! And all that fantastic food! I am mouth watering already! Ok, that food looks amazing! It would be worth the visit just to try the food. We love Orlando so much. 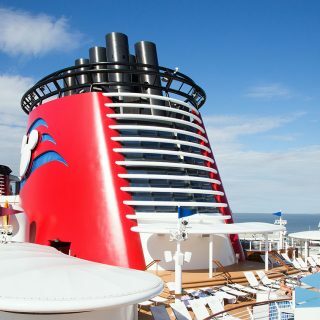 It is such a great place to vacation. We have been enjoying their food scene a lot these past years. We usually visit Orlando a few times a year. I will have to make sure that we check this place out next time! All of that food looks amazing! And I love that they have a lazy river at this resort. You get to eat for a living! That’s better than traveling for a living! Great review and photos — this resort looks fabulous for a romantic getaway! I’ve heard some other great things about that resort. Living in Florida we try and go to Orlando at least once a year and may need to put this on our list. 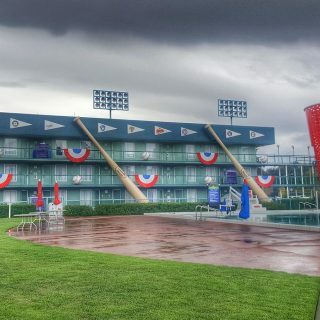 That looks Beautiful resort, when we plan next trip in summer to Orlando we will try to stay there. Food looks really delicious. This looks like an amazing adventure. I would love to visit this hotel. Florida has so many gems. That place looks absolutely gorgeous! I am hoping that sometime in the future that we can get down there and this is definitely the place to stay. I loved seeing the pictures and that Hamburger looks amazing. I wish it was closer as I could use some time away by myself. I am drooling over the food. It all looks amazing. I would love to stay here. I like to go to Orlando for the theme parks, so I’ll keep this in mind.